Get weekly emails about upcoming tech events. RI's only 2600 meetup. A great place to discuss technology and how we as practitioners use technology. Bring your brain, we'll supply the rest. This meetup is for people who have questions about WordPress and who need help with their websites. During our time together we answer questions, troubleshoot and sometimes even build websites. Please bring your laptop and any login information you need to access your website if you would like help. Our meeting spot is still to be determined. Please stay tuned. Code and Coffee is an opportunity for you to work on your own projects, continue practicing what you've been learning, and meet others who share your interests. Bring your laptop, your recent projects, and your programming problems and questions. If you have a project idea and some skills, but haven’t attended a GDI event yet? Want to focus on helping others with their projects? You're welcome too! Don't worry if you don't have a project already started. This could be an opportunity to find one. Don't forget to bring your laptop and charger if you have one! All attendees are expected to abide by the Girl Develop It code of conduct (https://www.girldevelopit.com/code-of-conduct). Join Ocean State Maker Mill member Matt Stultz for our Intro to 3D Printing class. This is our "3D Printing 101" class, where you'll learn basic skills behind 3D Printing technology. This class is $30 for non-members, and $10 for current Ocean State Maker Mill members (members use promo code). Attendees must be 15+, and under 18 must have a parent / guardian attending as well. We'll chat about robots and what makes a robot, a robot! Feel free to bring your robots, or any robot you may be working on. CareerDevs and IntraCity Geeks has been covered extensively by the news and media. The Aug 2018 issue of a popular RI magazine featured a full exposé on CareerDevs and the #SilconRhode movement which coined in 2017. Arnell & Cliff launched the CareerDevs Computer Science Academy in Providence, RI. The Academy is a 9-month immersive, intensive and intellectually rigorous dive into computer science. If you are interested in launching a career in computer science, then you should join CareerDevs today. visit www.CareerDevs.com/enroll ASAP. Providence Code Night with Arnell & Cliff will meet once per month. CareerDevs assistants will be on hand to assist, work with you and answer any questions you may have. Code Night takes place on the Second Wednesday of every month. Arnell launched the first Code Night Providence on Monday, May 11th 2015 in City Hall in partnership with Providence Mayor Jorge Elorza. 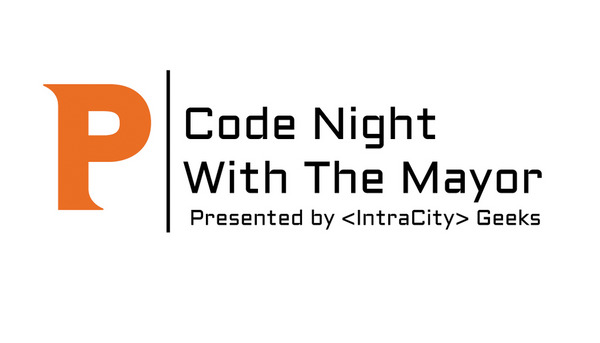 Providence Code Night with the Mayor Presented by IntraCity Geeks. IntraCity Geeks assistants will be on hand to assist , work with you and answer any questions you may have. Requirements: A laptop is required. Walkthrough #2 (intermediate level): Learn how to use the C programming language to a cryptography application. A cipher (or cypher) is an algorithm for performing encryption or decryption. Walkthrough #3 (Advanced): Learn how to use the C programming language to represent musical notes and make music. You will learn about sheet music, notes and how to represent these elements in ascii and C code. Arnell & Cliff have launched CareerDevs in Providence, RI and once a month you can come out to learn from some of the newest and some of the brightest minds in technology... for free! A laptop and an RSVP request are required. Space is limited to 40 attendees. CareerDevs students will be on hand to assist, work with you and answer any questions you may have. The first event took place on Monday, May 11th 2015 in City Hall with Mayor Elorza in attendance. Join Ocean State Maker Mill member Kelly Egan for our Intro to Laser Cutting class. This is our "Laser 101" class, where you'll learn the skills to get you up and running on most basic laser cutters. In this class you will also learn to customize a project. Please be sure to bring your computer for hands-on work. Code and Coffee is a time for us to get together and share our projects, ideas and get our questions answered. Our Code and Coffee event is open to all skill levels. It is a casual event and free to participate! Don't worry if you don't have a project already started. This is an opportunity to find one. On the other hand you may be along into a project and need some feedback about a problem. You may also fall somewhere in between! Feel free to bring your laptop and charger. *** Girl Develop It's mission is focused on providing opportunities for women to learn web and software development, but our classes and events are open to all genders and identities. Our Code and Coffee event is open to all skill levels. It is a casual event and free to participate. All are welcome! Join us in getting to know one another! Bring your laptop and charger! Please join us for freeform discussion of all things web. Drupal is a couple years away from being 20-years-old. In this talk, Matt Westgate will earn his 2275 user_id from drupal.org and share his high, low, and funny moments with Drupal and offer practical advice for anyone feeling burnout or uncertain about Drupal and the future. Food and drinks will be available for all who attend.